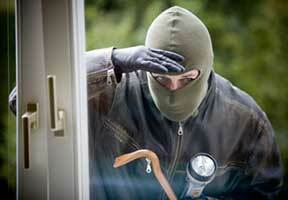 According to the FBI, nearly 400,000 burglaries occur in the U.S. during November and December each year. And the reason for that should be as obvious as the beards on “Duck Dynasty’s” male stars’ faces: Those are the months when so many of us are either away from home — whether on vacation or getting together with loved ones — or busy accumulating piles of shiny new gifts. *	Lighting. High-wattage exterior lighting, set on timers along with indoor lamps, help neighbors spot suspicious activity at night while giving your home what Siciliano calls “that lived-in look.” Adding motion sensors, though, has a downside: “They sometimes ‘ghost’ and give the impression that someone is there when he isn’t,” he says. * Garage Door Openers. Unplug them when traveling, and then repeat these words: A powerless GDO can’t be hacked with a universal remote. Yes, the huge box your new plasma TV, say, came in is an eyesore you can’t wait to put out on the curb with the trash. But guess what attracts the attention of crooks on their post-holiday prowls?